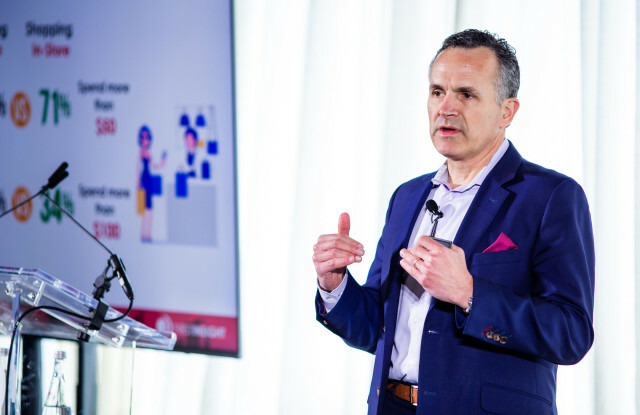 Jim Shea, chief commercial officer at First Insight, Inc., said "voice of the customer technology can give brands and retailers a competitive edge. The sales growth of the men’s wear market is outpacing women’s, and brands and retailers have a chance to better capitalize on it — as long as they’re using the right data and technology, said Jim Shea, chief commercial officer at First Insight Inc.
“The men’s wear market is outpacing women’s in growth, and that will continue for the next several years,” Shea told attendees, adding that while the total volume of women’s is far larger, the acceleration in men’s wear sales is an opportunity not to be missed. But how can brands and retailers leverage that growth? For his part, Shea said using data is a good start, but how consumers behaved in the past doesn’t guarantee what they’ll buy in the future. Which is why predictive and “voice of the customer” analytics can play an important role. Shea said keying into what consumers want can enhance customer-centric merchandising strategies by increasing sales and margins.